Commuters during a snowy Tuesday morning were met with some of the worst travel times the Chicago area has seen in years. NBC 5's Kye Martin reports. A pregnant woman gave birth in Chicago while stuck in massive traffic delays that plagued so many commuters Tuesday morning. Chicago fire officials said paramedics were called to a "maternity call" around 7 a.m., when a woman in advanced stages of labor was stuck in traffic on Lake Shore Drive in the city’s South Side. Authorities said the woman was in the passenger seat and the baby's father was driving. The couple had pulled over on their way to the hospital because snow and traffic were making the trip difficult. Paramedics helped the woman safely deliver a baby girl. A Lake Effect Snow warning will remain in effect until 4 p.m. Tuesday. 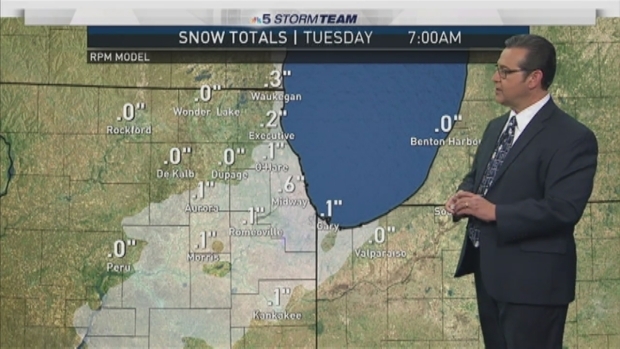 NBC 5 meteorologist Andy Avalos has more. The drive times during the snowy morning rush hour were some of the worst the Chicago area has seen in years. 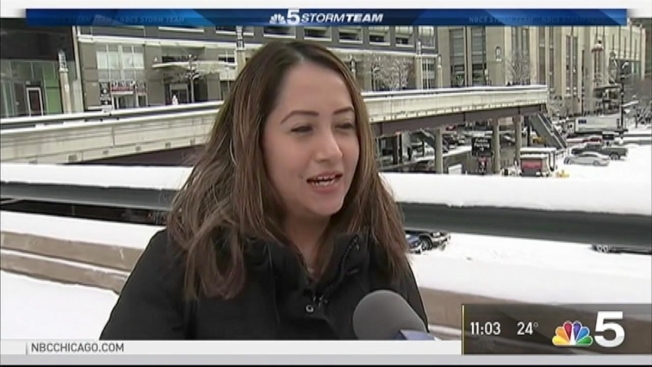 NBC 5 traffic reporter Kye Martin reported the travel times reported Tuesday morning haven’t been seen since the afternoon commute during the blizzard of 2011, when people were forced to ditch their cars due to weather conditions and lack of fuel. A Lake Effect Snow Warning was issued for Cook, DuPage and Lake Counties from 7 p.m. Monday to 4 p.m. Tuesday, with the potential for heavy lake effect snow that dumped several inches to the area overnight. A second warning takes effect at 9 p.m. Tuesday in Porter County in northwest Indiana and remains in effect until 9 a.m. Wednesday.